Less than a One Minute walk to the Gondola (50 Feet, not yards! ), Two Minutes to the Lionshead Ski School - literally! 2 Convenient Changing Rooms with Showers, Towels, Shampoo, etc. right next to Hot Tubs + Sauna...like having 3 bathrooms! NEWLY REMODELED BATHROOM with slab granite expanded counter, new cabinetry, new tub and high-efficiency toilet, sandstone vessel sink, new deluxe faucet. Note: Similar 2 bedroom down the hall (#974439 ) may be available - write owner for details. Has larger second bedroom, more living room seating. For a view, look at #480958, my remodeled One bedroom that overlooks the slopes - Sleeps 5. Large Exquisite Home 10 minutes away available for retreats, reunions, and larger groups. Package pricing available. This condo has received a Silver rating. After growing up on the icy slopes of the East, it was always my dream to live in Colorado and ski the fluffy powder! I made that happen and moved to Vail to raise my daughters in this magnificent setting that offers so much. As a psychologist, I know the importance of having a hassle-free vacation to 'rejuvenate' and make the most of your time off! Having owned our 2 condos at LionSquare Lodge since the girls were 1 & 5, I can't imagine a more convenient way to enjoy the slopes and amenities for families with children at any age. 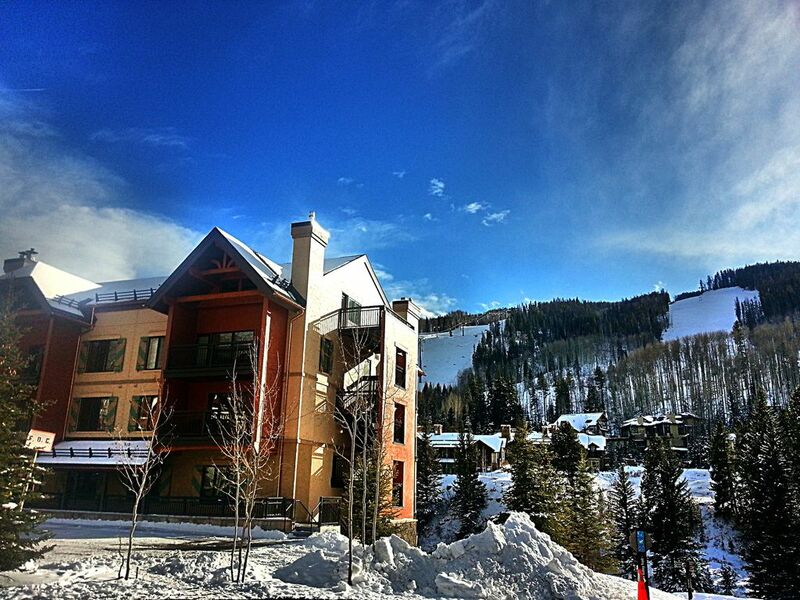 Vail offers the best of everything to adults and children, teens and singles. From the time my girls were little, LIonSquare Lodge has been their 'other' home, with its friendly, warm, ambiance that is welcoming and convenient. Now I share this amazing spot with my new husband ~ we're happy to show you our favorite powder stashes in winter and bike trails in summer. This unparalleled location has 'spoiled' us, and now we want to spoil YOU! Come stay with us here, and you'll keep coming back! LOCATION, CONVENIENCE, AMENITIES, VALUE, SERVICES! 1 full bath in condo; 2 restrooms down the hall; PLUS changing rooms with showers, towels, soap, lotion, hair dryers, etc. on 1st floor next to hot tubs and pool...so it's like having 3-5 bathrooms instead of one! Literally ON the slope, right in front of the gondola. Free ski storage ON the slope. If you ski too fast, you will pass it! Literally THE BEST location in Vail...the only TRUE ski-in/ski-out complex, where you put on your skis fight in front of LIonSquare Lodge! FULL State of the art gym with great equipment and tvs on recording. ELevators bring guests to this floor, garage on same floor; back door easily leads to garage.